Outlines plausible approaches to the issue including best-practice solutions. Part 1 presents ethical frameworks that cross-cut design, analysis, and modeling in the behavioral sciences. Part 2 focuses on ideas for disseminating ethical training in statistics courses. Part 3 considers the ethical aspects of selecting measurement instruments and sample size planning and explores issues related to high stakes testing, the defensibility of experimental vs. quasi-experimental research designs, and ethics in program evaluation. Decision points that shape a researchers’ approach to data analysis are examined in Part 4 – when and why analysts need to account for how the sample was selected, how to evaluate tradeoffs of hypothesis-testing vs. estimation, and how to handle missing data. Ethical issues that arise when using techniques such as factor analysis or multilevel modeling and when making causal inferences are also explored. The book concludes with ethical aspects of reporting meta-analyses, of cross-disciplinary statistical reform, and of the publication process. This Handbook appeals to researchers and practitioners in psychology, human development, family studies, health, education, sociology, social work, political science, and business/marketing. 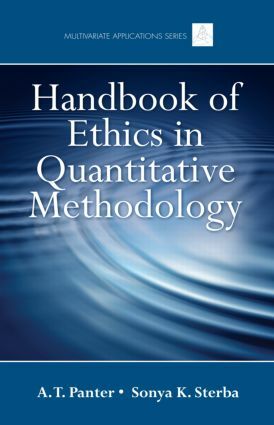 This book is also a valuable supplement for quantitative methods courses required of all graduate students in these fields.